The folks from Science @ NASA have a new ScienceCast looking at the chemistry of flames and how they behave differently on the ground and in space. And it's really surprising! According to the voiceover, flames can be hard to understand because they're complicated: they contain thousands of chemical reactions, even in a simple candle flame. In fact, even the shape is complicated. The teardrop shape of the flame is actually caused by gravity. 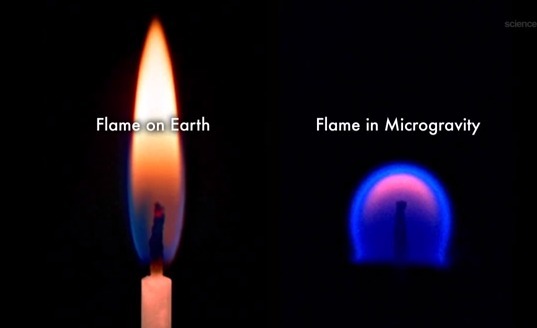 So what happens when you have a flame is space? And they have a great name for these odd flames: "space station flame balls". Love that. Anyone else think they look a bit like natural gas flames? If you take a look at the video below, at 2:30 there is a very kewl experiment with heptane where burning happens without flames or, more precisely, with cool flames. These experiments could help us develop cleaner ignition processes (see explanation starting at 3:50). Dog, I love science. Check out the video for more!